I am sure, you noticed that recently I am wearing clothing made of very airy fabrics. So also this time I will show you this kind of outfit, but a little diferently, because in oriental style. 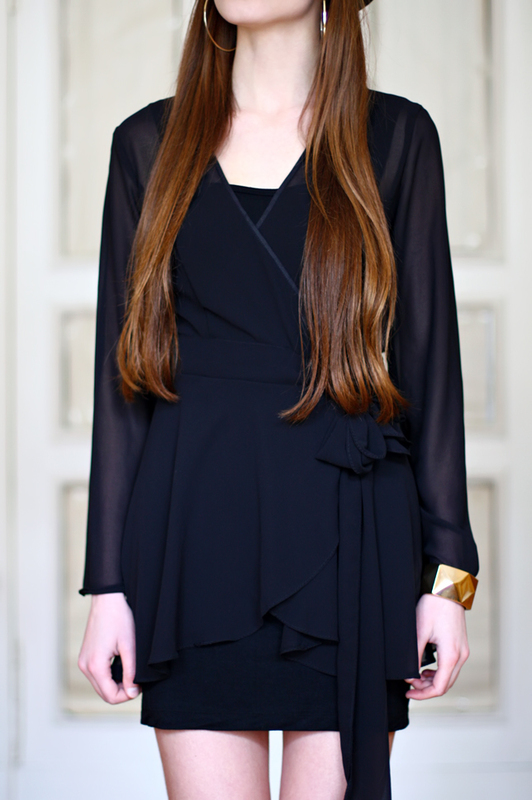 I have mixed up a short and tight black dress decorated by a tulle in the waist with the kimono-cuted tunic. Both from the ClubCouture.cc. To the outfit I've also add earings and wide bracelet. I could not make my mind up if better version is with the hat or without, so I am posting both of them. Which one do you prefer? Wow, wygląda genialnie!Zapraszam na nowy post! Love the dress. Great photos. To twoj naturalny kolor wlosow? jak ja Ci zazdroszczę tych włosów! Anyways, the pictures are lovely! love your style <33 anw this is the first time i come by,and i love your blogg <3 but the problem,i couldn't find the follow button :(( if you've time,mind reply to my comment and tell me how to fol you please? thankss sweetie,stay gorgeous!